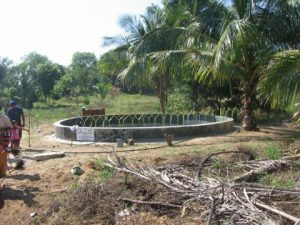 On 20th January 2017, Trustees Joy and David Cooper returned to the village of Manelgalla in the district of Wellawaya to see progress with the agro-drinking well project there. Construction work had been halted during the year as a result of adverse weather conditions, but they were delighted to see that the well had been completed and declared it officially ‘open’. It is a huge well with potential for significantly increasing agricultural production in the village in addition to enabling water supplies for drinking and cooking.